Keyword research is an important strategic marketing practice that, when thought of correctly, never really ends. While many people think of this type of thing as a technical aspect of search engine optimization (SEO), I would like to suggest that it’s so much more. If fact, the practice of SEO has changed so dramatically over the last few years that you must revisit everything you think you know about SEO, and that starts with revisiting how you think about keyword research. I’ll start with pretty much the Wikipedia version for context. Keyword research is a practice search engine optimization (SEO) professionals use to find and research actual search terms that people enter into search engines. So, the money part of that simplistic definition – actual search terms. That’s the power behind keyword research for SEO – the ability to understand the exact phrases people use to search for the products, services, information, answers and solutions that lead to them becoming your customers, but that’s just the beginning. Is it just for SEO? Sure, you need to do keyword research if you hope to get your content to rank highly on search engine ranking pages (SERPs) – and by pages I mean page one. But effective keyword research also helps you better understand search intent or why people are searching for the things they are searching. Intent is the key to unlocking new products and services. Ongoing keyword research helps you better understand the world of your ideal client so you can speak to them more personally. Personalization builds trust. Keyword research can be a very exhausting, complex, and confusing exercise – if you sell SEO services. But, in reality, anyone with a basic understanding of their business, their ideal client and the problems they solve can conduct effective keyword research with a few steps and a few low-cost or free tools. The first step is to start making a list of keyword phrases and terms that your ideal prospects are likely to punch into Google as they journey out there in search of solutions. This is not your final list; this is your big, creative dump of possible key phrases. Ultimately, you’ll get this list down to a manageable group, but better to consider from many. There’s no exact scientific way to create the best list – it’s a creative exercise that involves thinking like your customer – not like you the business owner. There are a few tried and true methods for finding suspects and few experimental methods they may turn up gold in the right situation. Step 1: Brainstorm – you and your team know some of the answers. What questions to customers ask, how to they talk about their problems, what were they looking for when they found you, which of your products and services are the most profitable? This is a great group exercise and often turns up a dozen or more great ideas. Step 2: Boards and Forum – Almost every industry has a handful of active bulletin boards and forums that people turn to in search of information and conversation. It’s amazing what you can find in these hangouts. People will often tell you exactly what they are looking for and can’t find. It’s also a great place to spot trends and recurring themes. Step 3: Auto-suggest and related – Now take a few of your terms to Google and start typing them into the search box. As you begin to type you may notice that Google starts suggesting terms related to what you are typing. Often this is a strong signal from Google that those are some pretty popular terms related to what you seem to be looking for. Take note as they may help expand your list. 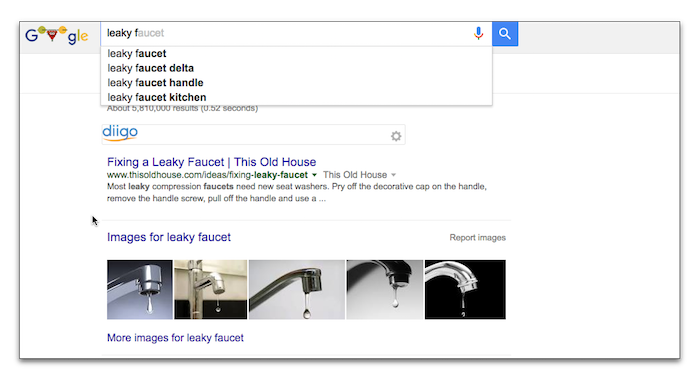 After you complete a search, scroll to the bottom of the results page and not what Google calls related searches – again, another easy way to get some great ideas. Step 4: Google Search Console – Another good keyword practice is to understand what you already rank for. There’s a good chance that you are already getting traffic for some of your key terms and knowing this will help you understand what you might do to make these even stronger. The Google Search Console is a useful tool for just this. Connecting your site to Google Search Console is a smart thing to do no matter what as it also allows Google to let you know if they find broken links or pages or any other issues that might be hindering your search results – but this is also where you’ll be able to see if your pages rank for any keywords currently. Okay, now you should have a list of 30-40 terms to work with. The goal of the next phase is to create a two final lists. 1) Your 4-6 foundational phrases and 2) Your 8-12 long-tail phrases. I’ve written about this idea for a few years now – Here’s more detail on foundational content – How to Make Content the Voice of Strategy. Foundational phrases are central to what your business does and should be seen as phrases you intend to invest significant time, effort, networking and content into earning rankings. One of these terms must be the focus of your home page, and the others must have landing pages or entire sections of your site dedicated to them. Picking your foundational terms comes down to a mix of data points. Certainly, if you are plumbers you’ll probably want to win terms related to what you do, but you must consider a few things as you make these choices – how competitive is the term and how specific is the intent. Of course, now that you have your well-informed list, it’s time to go to work and prove some of your theories. For this, we will turn to a handful of tools – the first of which is the Google Keyword Planner. Now, many people writing about keyword research start here, but I think this tool is too limiting as a brainstorming tool and starting here will simply lead you to create the same list as everyone else. By coming here with an already expanded view of the world, you can refine based on data. Search volume is useful, but it’s just a guide – sometimes high volume search terms aren’t really that useful for your purpose. When you combine search volume with bid price, you’ll start to see some important correlation. High bid price often signals high conversion value – not always, but you’ll start to see the variance in bid price as an important sign as you do this research. Your goal is to identify and edit your actual phrase by using a mix of search volume and bid price. I say a combination or balance because high bid price may signal a very competitive search term as does high volume. You are likely looking for middle ground between those two variables. 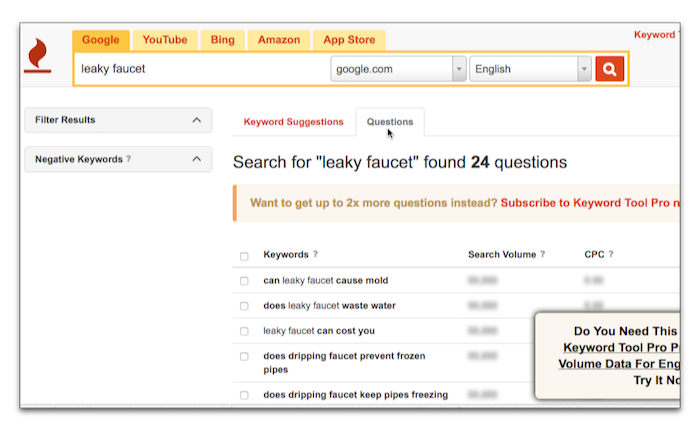 Three other tools I use to help refine my keyword research are Keywordtool.io, Yoast Suggest, and Google Trends. The main reason I use Keywordtool is that it turns up actual questions people ask about specific terms and to me this is one of the best ways to find intent in a search phrase. It’s also a way to start thinking about the specific content you might produce for your long tail phrases – answering questions you know people are asking about a topic is a killer way to think about your blogging routine. 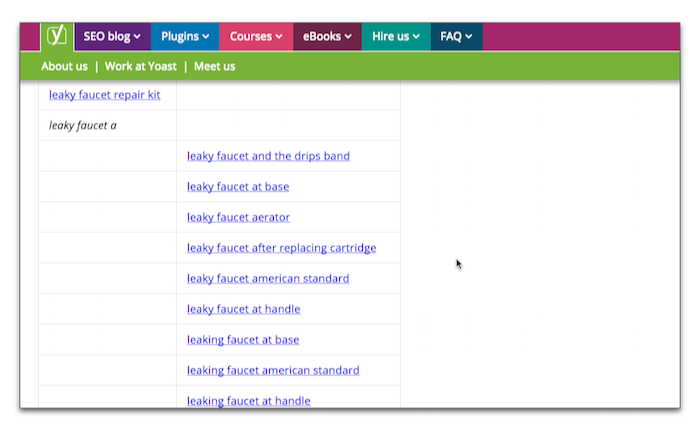 Yoast Suggest is a tool from Yoast of the WordPress SEO plugin fame. This tool uses the data from Google suggest to create a seemingly unlimited set of related search terms grouped alphabetically. Google Trends can help you get a sense of how a term is moving or how it compares to several other phrases. A search term that has decent search volume but also has 50% less volume than last year might not be a term you want to invest in as a foundational theme. 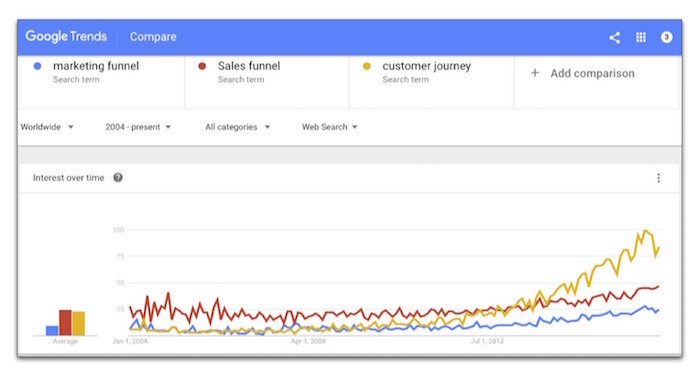 I love to share the Google Trends graph above as a way to demonstrate how common marketing terms have trended over the past few years. Google Trends is also great for showing seasonality of search terms for businesses that need a peak at that kind of thing. Okay – now the payoff. 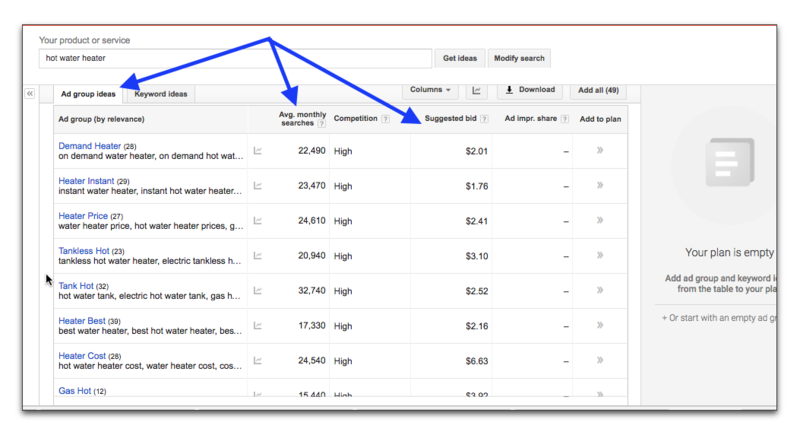 Great keyword research informs your editorial calendar. Or at least it should – and that’s why you never stop doing it. 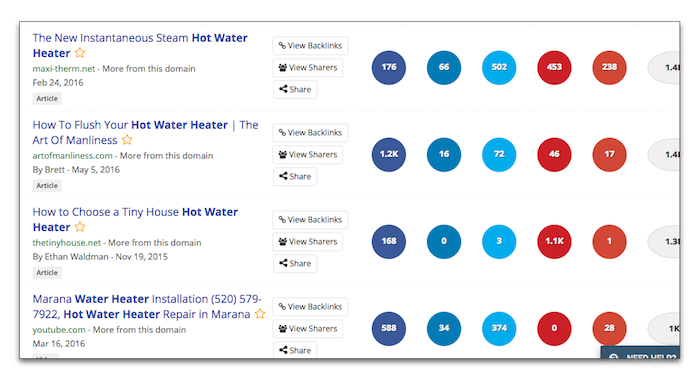 After I have my list of keyword phrases, foundational and long-tail, I turn to BuzzSumo to find out what kind of content people are writing and sharing around these search terms. BuzzSumo is a search engine that ranks content by how often it’s been shared. This is a great way to start getting even more specific about the content you might write in your upcoming blog posts. You’re not going to copy; you’re going twist, enlarge, and intersect your content based on these proven winners. A couple of bonus data point from BuzzSumo – you not only see how many shares a post has you get to see what sites have linked to the content and who has shared it. Obviously, this isn’t much help if it’s a Mashable post, but what about a direct competitor – it just might help give you some ideas for connecting for links to your next awesome post. And now that you have your keywords prioritized, and you are starting to identify opportunities to rank for those terms, it’s time to up your game with Rand’s How to Build a Killer Content Keyword Map for SEO. You can learn more about keyword research and everything else you need to know about SEO in my latest book SEO for Growth: The Ultimate Guide for Marketers, Web Designers & Entrepreneurs, co-written with Duct Tape Marketing Consultant Phil Singleton and due in stores and online Sept 16th, 2016.